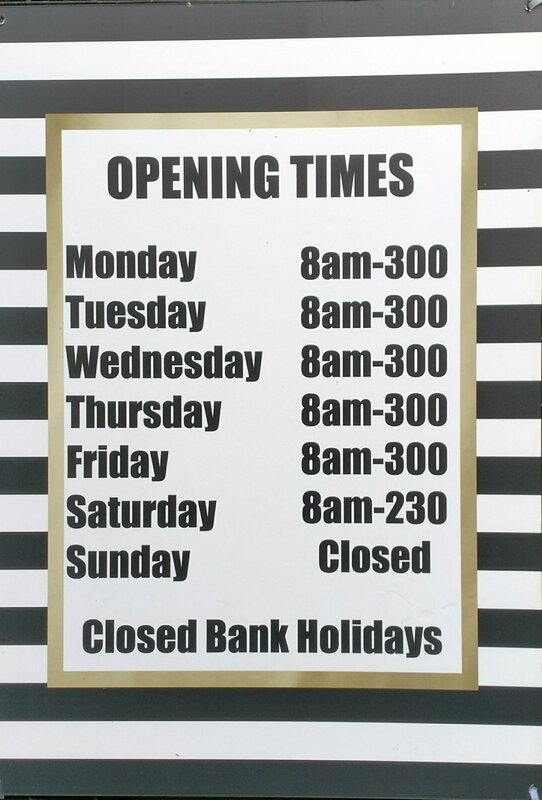 It is fair to say that Tremorfa is not one of my usual stomping grounds in Cardiff when it comes to looking for food. I am based in the West of Cardiff and very rarely get over to Roath (really should do more so) let alone Tremorfa of an evening or at the weekend for a bite to eat. At lunch time, whilst my city centre base is closer, a trip out to Tremorfa requires getting the car out of the office carpark. I am not one of those people who enjoys driving that much so once my car is in it’s spot it normally stays there till home time. As a result I need a good reason to go out that way and a blog post by Mac n Me, showing a rather fine looking (and very keenly priced) burger and hot dog at the Tremorfa located Luvly Grub, provided the necessary kick up the backside one lunch time to get me away from my desk and in the car Tremorfa bound. The exterior is a rather garish cerise and you won’t miss it whilst driving past that’s for sure. Parking is on the street, but plentiful so allows for pretty easy access by car. Not sure re public transport. with the somewhat odd addition of a number of full size toy soldiers (which looks like they were straight out of the shop of the toymaker – Benny Hill – in Chitty Chitty Bang Bang or (slightly more cultured) the Nutcracker. Free WiFi is available, which is always a bonus. 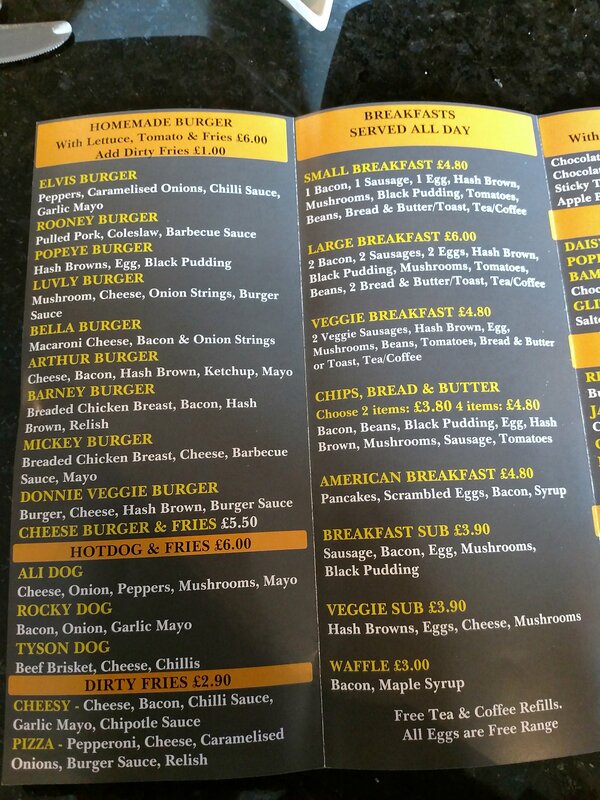 The mainstays of the menu are burgers, hotdogs (all £6.00 with fries, bar from the cheese burger with fries which is £5.50) and breakfasts. 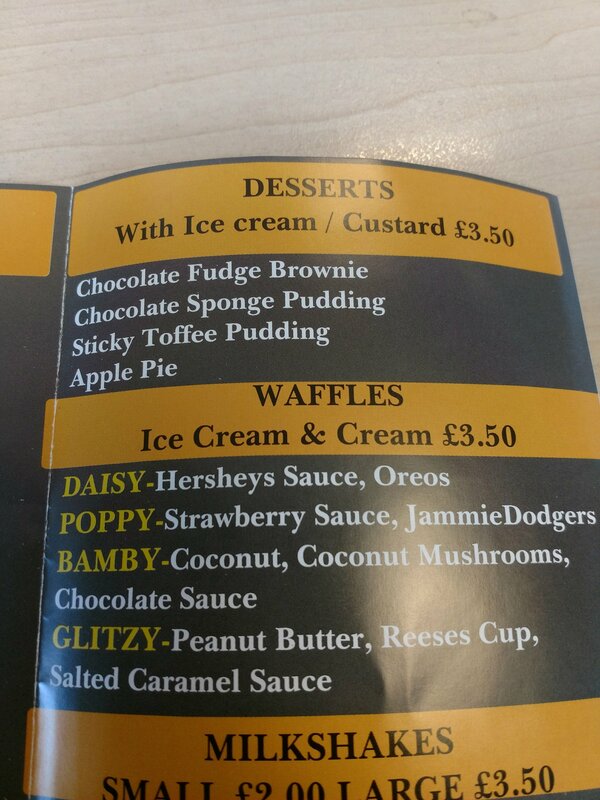 Finally you have a selection of desserts and waffles (all £3.50) for those with a sweet tooth (and a big appetite). As the title suggests, a mate (from work) and I were there for a burger (me) and an all day breakfast (him) and we were not disappointed. 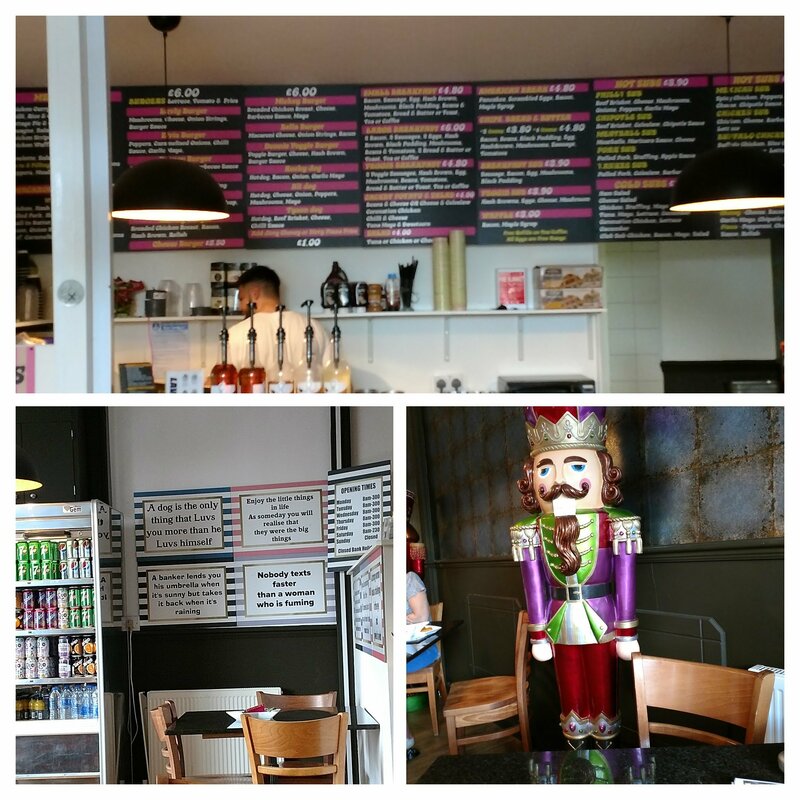 Having heard only good things regarding the burgers, I decided (from the interesting choices on offer – surely peanut butter and bacon should feature in the Elvis burger or is the Elvis “Costello” rather than “Presley”) on the Luvly Burger. What arrived was a behemoth of a burger packed with onion strings, cheese, burger sauce (reminiscent of Big Mac sauce), mushrooms, lettuce, tomato and, of course, the patty. Eating it required the jaw to unhinge somewhat and it was a very messy endeavour (I went through a prodigious number of napkins). Notwithstanding the challenges its size presented, in terms of eating it, this was a good burger. The patty was hand made (with lots of nice crusty nobbily bits on it), nicely flavoured (good beefy umaminess to it) and properly seasoned. It was cooked medium (rather than medium rare, which was a shame – no warnings on the menu of Ragnarok or zombification so I assumed no medium rare option – but perhaps I should have asked if they do them medium rare) but a very tasty burger nonetheless. The onion strings were oil free, nicely crisp in a light batter and very plentiful. Decent veggies (crisp lettuce and toms that tasted of something) and a good bun finished off a really very good burger (one of the nicest – cooked medium – I have had in Cardiff). 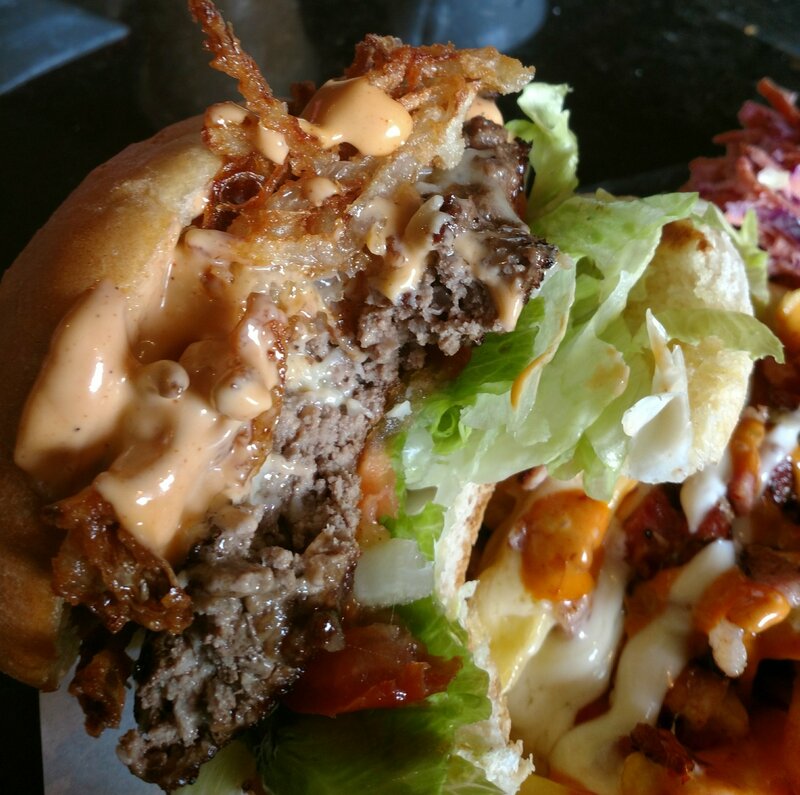 The bun had a good level of squishability to it – essential here for getting the whole shebang into the gob. Size wise, it was perhaps a tad big (less can be more in burger terms) as it was a bit of a struggle to eat it without resorting to cutlery (if you require a knife and fork to eat a burger the bun becomes pointless in my opinion). I did, however, manage it without utensils so it passed (just) the test on that front (I do, however, have a big gob). My burger came (included in the £6 price) with chips and a vinegar based slaw (I tend to prefer my slaw a bit sharper, but it was pleasant enough) on the side. 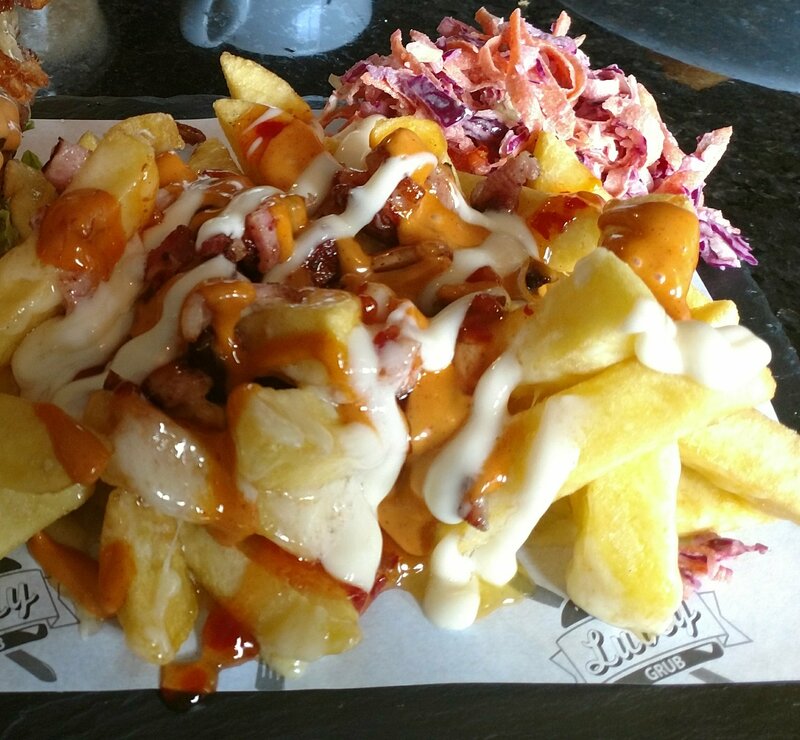 I did upgrade (£1) to dirty fries. The dirty fries were nice enough if not up there with the excellent burger. I would happily have eaten the burger without the fries (dirty or otherwise) and just the slaw on the side (worth having that as an option I think). The only real negative for me (others my not care) was it all came on an accursed slate. I would have been much happier had it been on a plate rather than something best suited as roofing material! My fellow diner went for the large all-day breakfast (£6), which (as with the burger) was a big old beast (thankfully on a plate rather than slate) and what I would call fully loaded. For £6 (including toast and tea or coffee with free refills), it was quite the bargain. My fellow diner said it was tasty and filling, with nicely cooked bacon (crisp rather than flabby), properly runny (free range) eggs, a decent hash brown, mushrooms (not watery) and slice of black pudding. 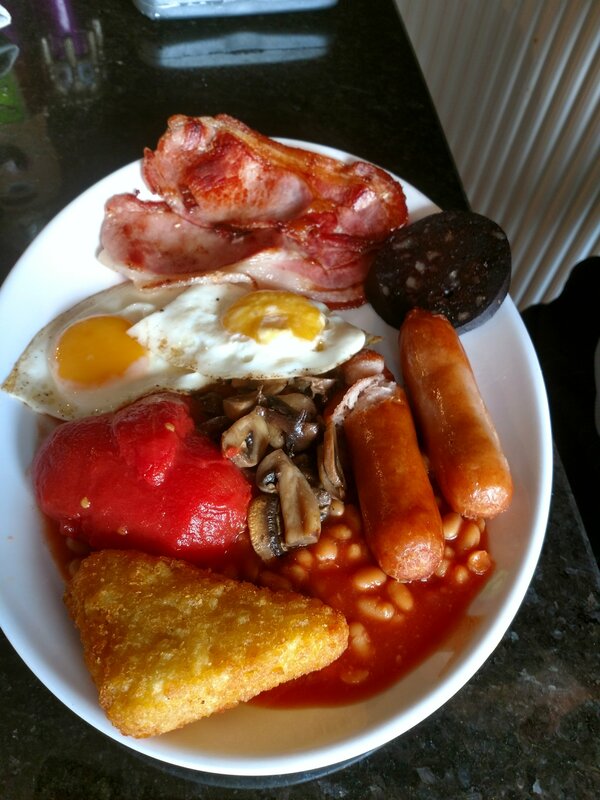 As for the beans – not a huge fan of them myself but many are – they were apparently nice enough The only minor let downs were some rather bog standard sausages and a tinned plump tomato rather than a grilled fresh one. On the drinks front there is no booze on offer currently (I hear tell this could change going forward and a decent beer or a glass of a good Malbec or a Cote du Rhone or even a dry Oloroso – long shots the latter three I concede – would have been rather nice with my burger), but this suited us as it was a working day visit. 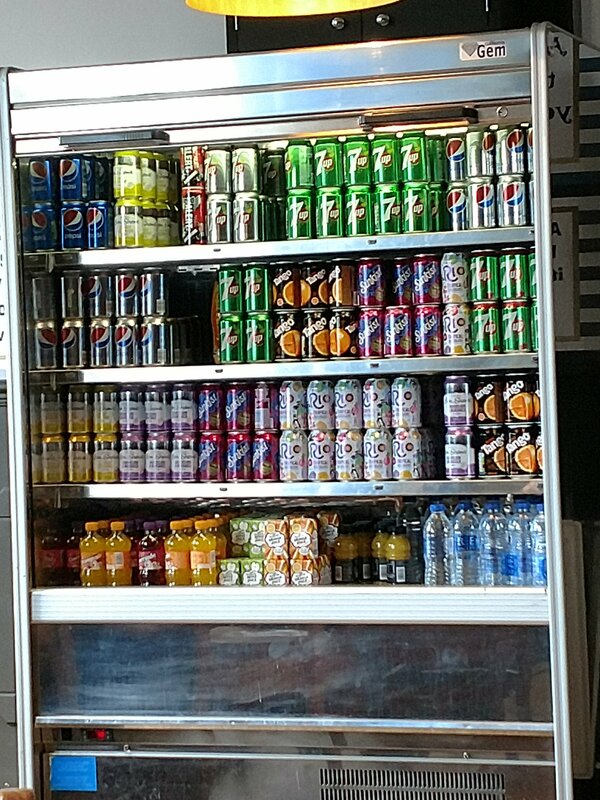 and a good selection of canned soft drinks (not sure of price). 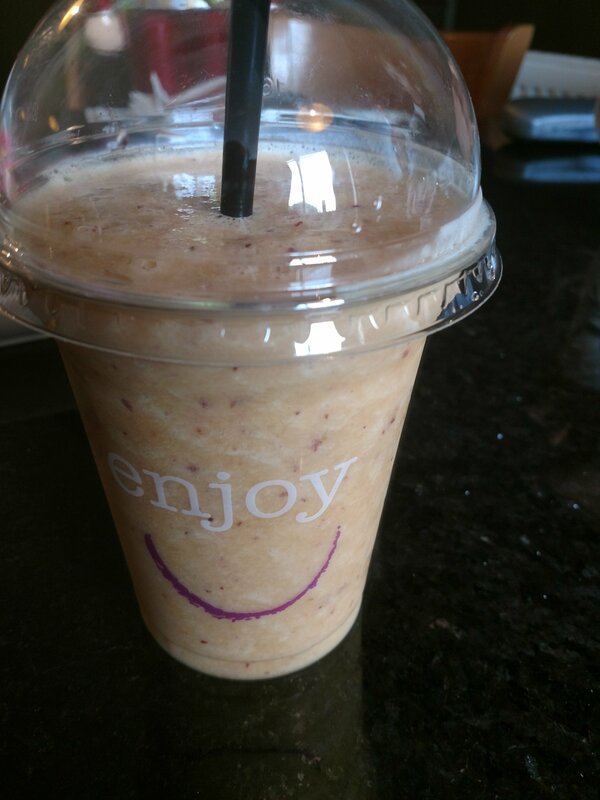 I went for the small fruit smoothie (£2, the large is £3), which when it arrived looked alarmingly like something that had just been regurgitated! It was actually (belying it’s very dodgy appearance) quite nice (melon heavy) and very refreshing (best to close the eyes when drinking it mind). The breakfast came with a tea or coffee (with free refills) in the price, making for an even better value offering. 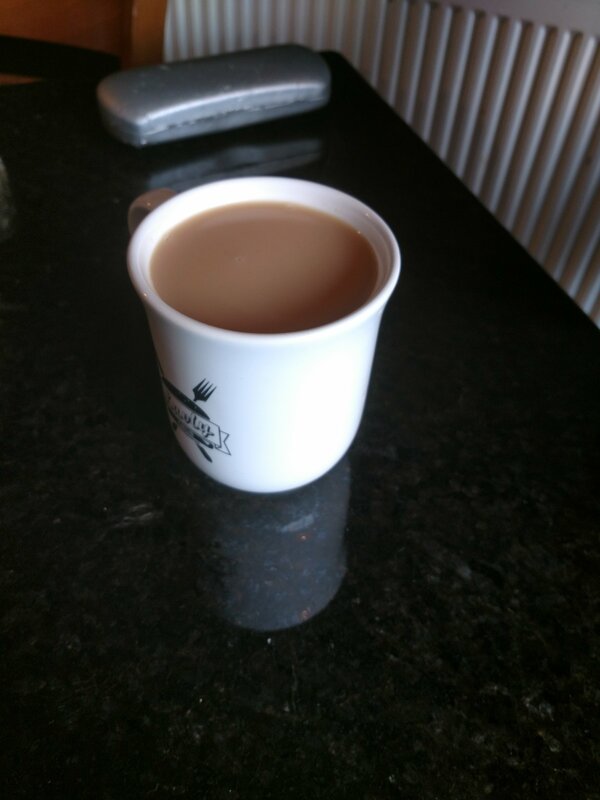 Decent cup of builders tea was my friends verdict. A true hidden gem this one. 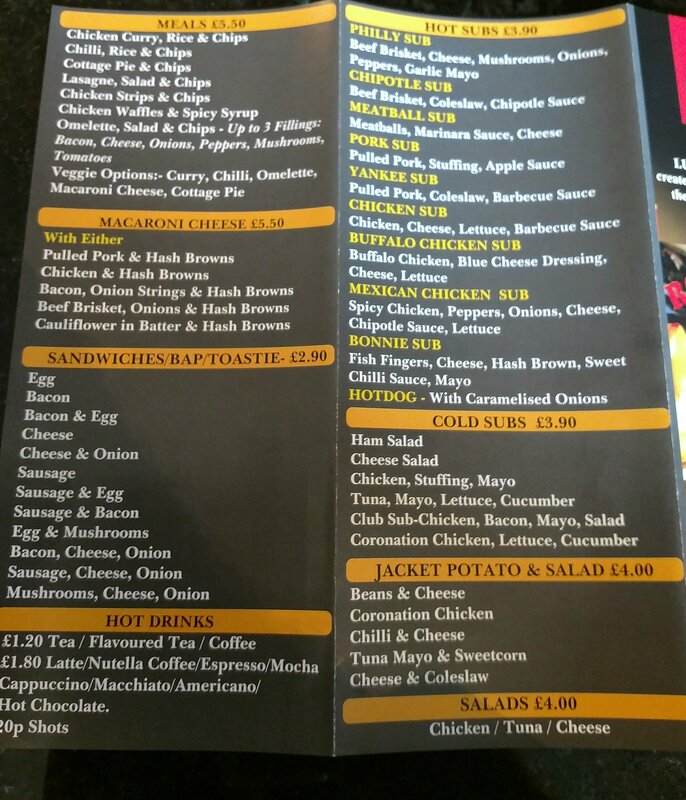 A really good burger at a very nice price and a super value all day breakfast. What’s not to like! If it was in the city centre I think it would make a killing. It is certainly worth, along with Prego Street Food, a trip out Tremorfa way for a feed. The burgers here, in my opinion, put American imports Shake Shack and Five Guys to shame (bigger, better and a whole lot cheaper) and I would put it on a par with what is on offer at Burger Theory at Kongs (which I rate) in terms of quality (and here it is a fair bit cheaper). I paid £9 for my burger, dirty fries, slaw and a fruit smoothie and my mate £6 (including tea and toast) for his breakfast. I think for the quality and quantity of what we got that represents excellent value. Would I go back? Oh yes. 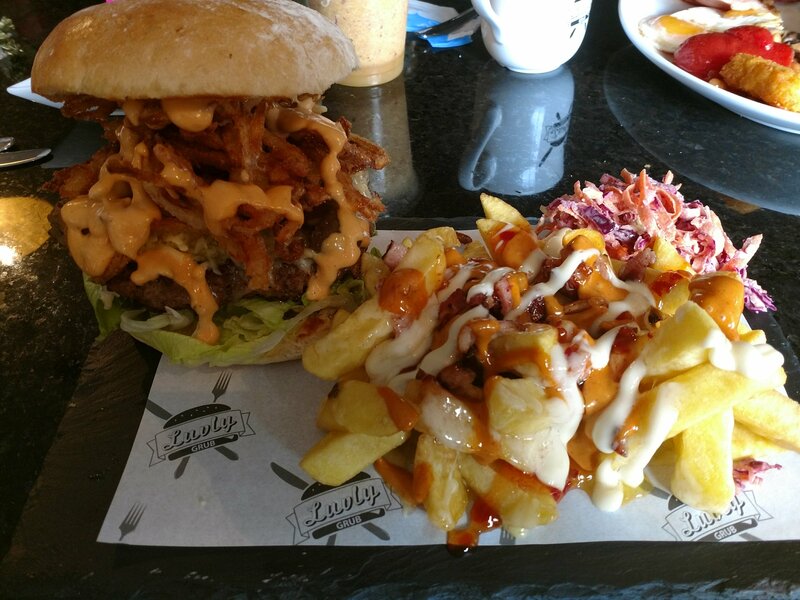 Cracking little joint, serving up one of the better burgers I have had in Cardiff. 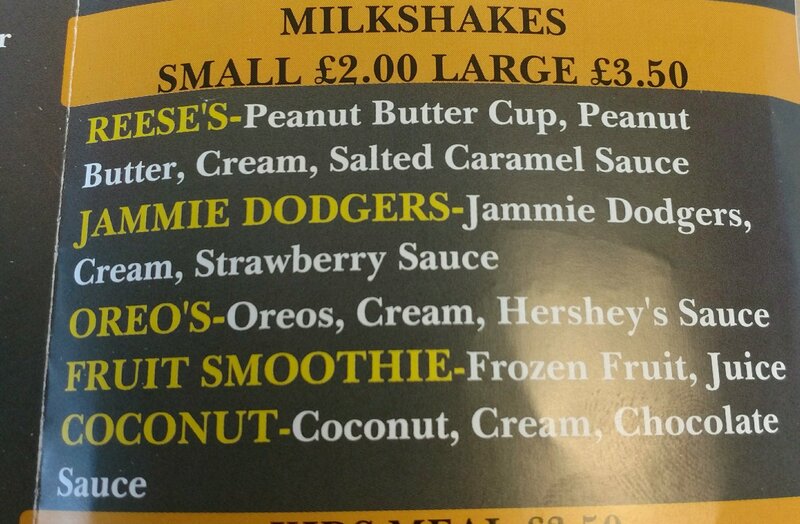 Might go for a hot dog or the basic cheese burger next time to save my jaw mind! If you like a good burger or breakfast (and a bit of a bargain) this place should definitely be on your list. Just one quibble – ditch the slate and put it on a plate. 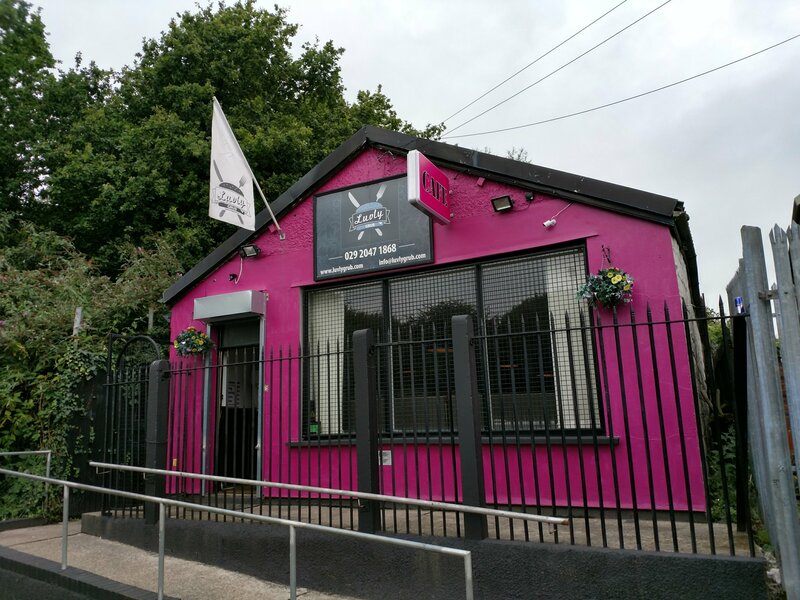 Address: 17 South Park Rd, Tremorfa, Cardiff, CF24 2LU. 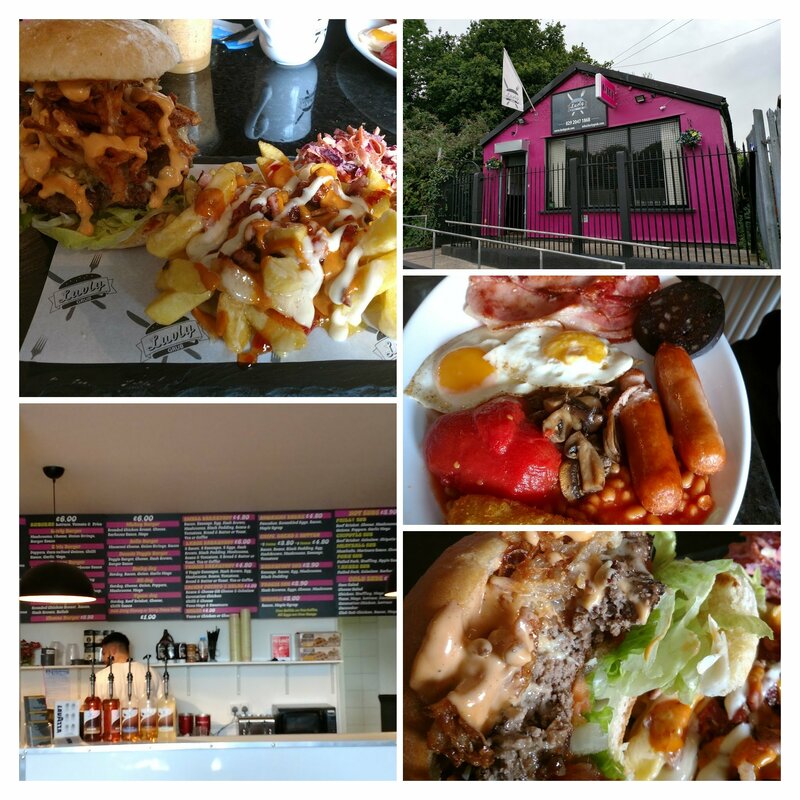 This entry was posted on Aug 27, 2017 by solicitingflavours in American food, Argentinian wine, Bacon, Barbecue, BBQ, beef, Beer, breakfast, Brunch, Burger, burgers, cafe, Cardiff, Cardiff restaurant, cheese, coffee, craft beer, Diner, Drink, Fast food, Food, French wine, hot dogs, Lunch, lunchtime, Luvly Grub, milk shakes, Non alcoholic drink, Red Wine, restaurant review, review, salad, Sandwich, sausages, Tremorfa, Uncategorized, waffles, Wales, Wine, wine pairing, wine pairings.